The close-knit community that thrives in Walkley today is a result of strong community action in the late sixties and early seventies. In 1970 Walkley was written into plans for slum clearance below South Road and Howard Road. A great deal of the housing in this area of Sheffield was in poor condition, often without modern amenities such as running water and indoor toilets. The council proposed to demolish housing as part of slum clearance and build modern housing or flats in its place. The residents of Walkley opposed this threat to their community and united to resist it. The principal campaigner was University of Sheffield student Geoff Green, who was shocked at the threat to this tight-knit Sheffield community. Arriving in Sheffield in 1968, Green was a PHD student and research assistant at the university, a short walk from Walkley. Green stood for the council as an independent candidate in 1970 and only narrowly lost out with a respectable 772 votes. 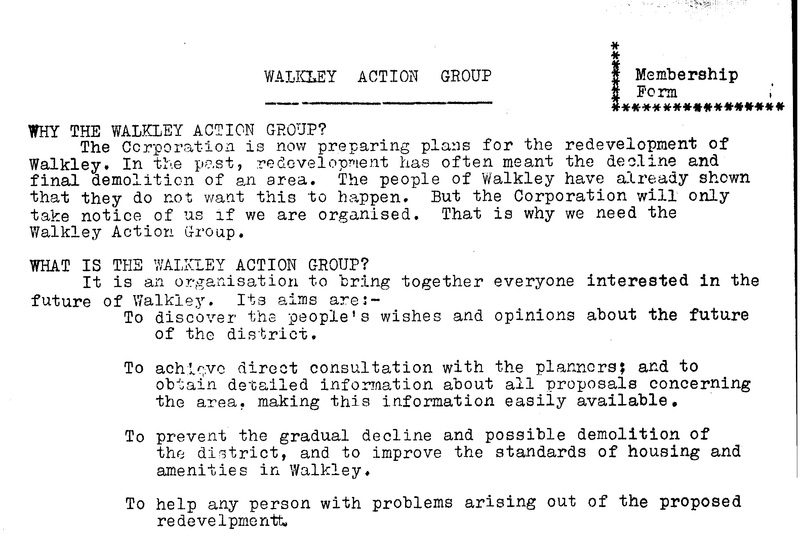 Green started the Walkley Action Group (WAG) to bring the residents of Walkley together to fight for their community and bring Walkley out of slum clearance. With help from Architecture students at the University, WAG mapped their alternative suggestions to the council plans. Some of these fantastically detailed maps are contained within this archive. They also held regular meetings which were attended by hundreds of local residents and council officials and planners with the 1972 meeting as a particularly memorable one according to the assistant planning officer, Narendra Bajaria. WAG also vehemently opposed the Kelvin Flats development., arguing these blocks of flats were not a viable alternative to the traditional terraced housing of the Walkley area. Veronica Hardstaff was the Labour councillor for Walkley during this period of proposed slum clearance. Mrs Hardstaff was also in favour of improvement rather than clearance and, as a result, worked hard to persuade the council to change their plans for Walkley. In 1974 the proposed improvement area was officially approved by the council. This approval was a direct result of the collaboration between local residents and councillors like Mrs Hardstaff in saving the community of Walkley. Some areas were still up for demolition but large areas of the former clearance plans were now going to be renovated, modernizing the houses and ensuring that residents enjoyed modern amenities and comfortable living conditions. To do this, residents could apply for grants from the council. 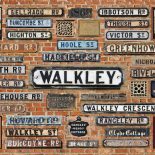 The history of Walkley is significant in showing how community spirit can be a strong force for change. Over recent years, Bill Bevan has worked hard to collect together materials from this fascinating period in the history of this small Sheffield suburb, including maps and surveys drawn up by WAG and official council plans. Through collaboration between Walkley History and the University of Sheffield’s Witness project the archive is presented in full here. The Slow Death of a Slum. 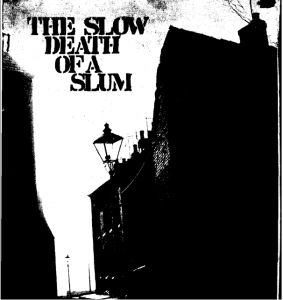 The Slow Death of a Slum was a research report carried out by students at the University of Sheffield. Based on a survey of residents still living in the clearance zone, this report details what it was like to live through a slum clearance. Many of the students involved in this report, including Geoff Green, were part of the Walkley Action Group, and this document is a good introduction to the issues the Walkley Action Group were facing. Below is our Walkley Action Group Archive. These materials document in great depth the experiences of living though the post-war slum clearances that affected so many of Britain’s big cities. This archive offers a rare glimpse into the experiences of the residents of slum clearance, and documents their fight to save the suburb of Walkley.